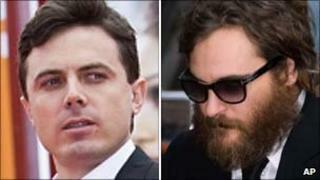 Actor Casey Affleck has admitted the documentary film he made about Joaquin Phoenix quitting Hollywood to become a rap star was staged. Affleck told the New York Times that Phoenix gave a "terrific" performance". Over the last two years, the actor has behaved strangely in public, leading fans and critics to wonder whether he was documenting a breakdown on film. I'm Still Here was shown at the Venice Film Festival this month, where Affleck insisted the events were genuine. At a press conference, Affleck said: "I sincerely do not want to influence people's interpretation. "I can tell you there's no hoax, the idea of a hoax makes me think of candid camera and things like [MTV prank show] Punk'd. "It never entered my conscience, until other people started to talk about the movie." But in the interview with the New York Times, Affleck acknowledged that Phoenix gave "the performance of his career". He added: "I never intended to trick anybody." Speculation about the documentary began when a bearded, bedraggled Phoenix appeared on David Letterman's chat show in February last year, seeming confused and incoherent. Affleck told the newspaper that Letterman was not in on the joke. The, now infamous, interview ended with Letterman saying to the actor: "Joaquin, I'm sorry you couldn't be here tonight." Phoenix, whose sister Summer is married to Affleck, is due to return to Letterman's show next week, but this time he will not be in character. I'm Still Here includes footage of the actor apparently taking drugs, surfing the internet for call girls, diving off a stage to attack a heckler and vomiting. It also features rap mogul Sean Combs, otherwise known as Diddy, who finally agrees to listen to a demo of the actor's hip-hop music. Combs recently won praise for his role in Russell Brand comedy Get Him To The Greek.